During the 61st Colorado Auctioneers Association Convention, auctioneers from all over the state competed in the annual State Auctioneer Championship with Michael Nichols, owner of Nichols Electric, being crowned as the champion. He is pictured with his son, Rylee Nichols, the 2018 Colorado Jr Bid Calling Champion. 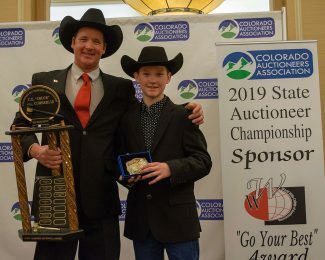 During the 61st Colorado Auctioneers Association Convention, auctioneers from all over the state competed in the annual State Auctioneer Championship with Michael Nichols, owner of Nichols Electric, being crowned as the champion. The competition consists of two rounds of auctioneering at a live public auction held at the convention. Each contestant is judged on appearance and presentation, body language, chant and desirability to be hired by the judge. Along with the title, the state champion receives a custom designed belt buckle, the coveted Chuck Cumberlin "Go Your Best" trophy and a cash prize to compete at the National Auctioneers Association International Auctioneers Championship being held in July during the NAA Convention at New Orleans. Nichols, of Flagler, is a second-generation auctioneer and graduated from the September 2011 World Wide College of Auctioneering class in Denver. At the 2012 CAA Convention, Nichols was awarded the Troil Welton Memorial Award for the CAA First Timers Competition that represents auctioneers competing that have graduated from auction school within a year of the convention being held. Troil Welton, of Wray, Colo., was known for the encouragement he gave to young, aspiring auctioneers. Nichols is a contract auctioneer, in addition to being a co-owner of Nichols Auctioneers in which he and his brother, Lance, are proud to join their father, John Nichols, who is a CAA Hall of Fame recipient, in the auction industry." Helping people in his community and the surrounding area is personal for Mike and his family. Nichols Auctioneers sponsor several organizations and associations in local communities, especially for youth programs. As Nichols stated, "The local communities in which we live and work in are top notch people and a great place to raise a family." Nichols is also the father of Rylee Nichols, the 2018 Colorado Jr Bid Calling Champion, in which he assists his dad in raising money at various fundraisers to help communities. In his own words, Nichols shares that "I have been blessed to work with great people in our auction family and will give my best effort to represent the auction industry and CAA as the 2019 State Champion. I am blessed to have the best wife and four kids a husband and father could ask for. 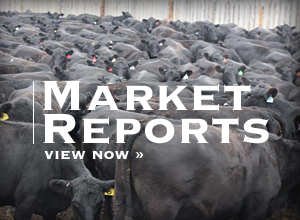 Between Nichols Electric, LLC, cow/calf ranch operation, auctioneering, school activities and various church and community boards, we try to spend our spare time with family and friends." The Colorado Auctioneers Association has about 150 members and promotes the auction method of marketing to all buyers and sellers through continued professionalism, education and experience. 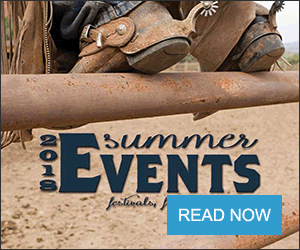 More information about the Colorado Auctioneers Association is available online at http://www.coauctioneers.org.